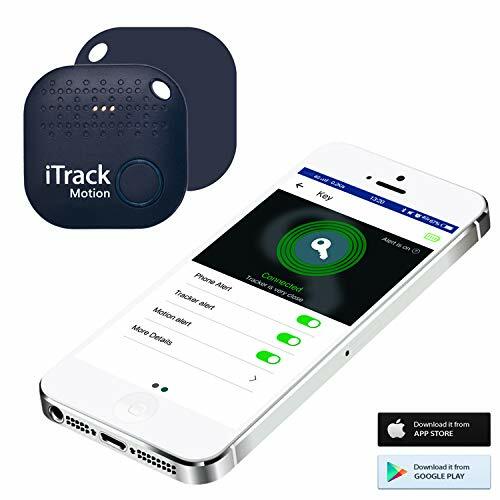 ✈ Motion Alert Function Added - Industry product has no motion alert function, but iTrack adds new motion alert function to detect item movement which is good care for valuables. ✈ Low power Bluetooth - Compared with similar products, the power consumption is reduced by half. ✈ One year long standby - Sony CR2032 Battery. Normally, it can be used for one year. ✈ Volume boost - Efficient sound driver chip. The volume is greatly improved compared to the industry peers which can effectively remind. ①. Contains small parts, presents choking hazard. ②. Keep out of reach of children below the age of 3 years. ✅ MOTION ALERT - Previous iTrack has phone alert and tracker alert only. 2018 New designed iTrack key finder has added motion alert fuction that the Tracker and phone will beep when Trackers is moved. Keep an eye on your luggage, jewel box, baby carriage. ✅ FIND YOUR PHONE - Just Long press the iTrack motion key finder button can make your phone ring with Bidirectional Find Function - even on silent! iTrack finder button can use as a selfie remote - Remote taking photos. ✅ LOCATION TRACKING - See it on a map, uses bluetooth to tell if you are near or far. iTrack app remembers the last time and place it saw your iTrack Motion, so if you left it somewhere, you'll always know where to look. ✅ ANTI-LOST ALARM & 3 TIMES LOUDER - Connect device through bluetooth. Use Tracker App to find your Item fast, easily loops onto keychains or attaches to anything you don't want to lose. Effective range: 32-50ft indoor; 50-80ft outdoor. ✅ SONY BATTERY - 3V Sony lithium battery will make the item work for ultra long life time with Low-power consumption. Comes with low-energy battery in the iTrack. you can use our pick tool to open iTrack. If you have any questions about this product by iTrack Motion, contact us by completing and submitting the form below. If you are looking for a specif part number, please include it with your message.